FromScratch, the autosaving note taking app I built, just got another update: it now has additional search and replace functionality. It continues to do great in terms of downloads, I’m very happy that this tool helps so many other people. You can download FromScratch 1.2.0 from the site Fromscratch.rocks or the Github releases page. Search functionality was one of the first feature requests I got. Back when releasing FromScratch this wasn’t very high on my list, but it’s a useful function to have and I’m glad I took the time to add it. When you search, the matches are highlighted both in the text as well as in the scroll bar, so you always have a good sense of where all the occurences are. Using the minimap in Atom taught me the benefits of having an overall indication of where in your document there are matches. Codemirror, which FromScratch uses for text handling, also has support for search and replace, replace all, and jump to line, so I made sure to add all those as well. Something I particularly like is jumping to a relative line: Ctrl+g, then typing +5 moves your caret 5 lines down. There’s a number of architectural things I want to change, but that’s not something FromScratch users will notice so I won’t make releases unless they have a clear benefit. Theme support is still something I want to add, But I need Chrome’s CSS4 color support to mature a bit for that. FromScratch really only uses two base colors, but a whole slew of scss functions to get a range of slightly lighter and slightly darker colors to style things like selection and highlights. These are available in CSS4 too, along with nice ways to deal with both light-on-dark and dark-on-light color pairs. Once I can use that in Electron, I can add theming using just a pair of foreground and background colors. 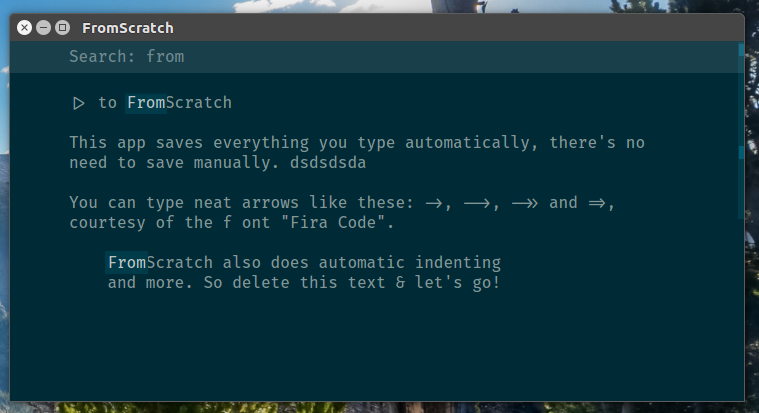 FromScratch 1.2.0 is a free download, and you can get it now from the site Fromscratch.rocks.